It all started with an idea! An idea to add a little more fun and spice to our Caesars, an idea to impress our buddies and enjoy the most flavorful Caesars and Bloody Marys, an idea to tantalize our taste buds and give them something "EXTRA" ordinary! My wife and I along with my buddies, well, we do enjoy a great Flavourful Caesar Cocktail, as most of our Canadian families do as well. The Caesar Cocktail is far and away the most popular drink in the entire Great White North! And we are proud of our spin on this fantastic drink; using premium spices and juices as well as top-shelf spirits to make an awesome Caesar Cocktail that will blow your doors off. You’ll taste the quality! Before we came up with Walker’s One Shot, it would take 25 minutes to put one of these masterpieces together. My awesome crew and I decided that we’d rather spend our time enjoying our spicy, supercharged Caesar Cocktails than blowing all that time making them. 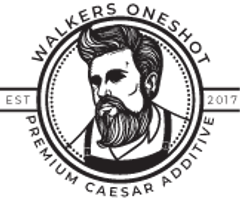 I said to my wife and buddies “Wouldn't it be great if there was a Premium Handcrafted Caesar Mix, an all in one if you will- a OneShot!” So, we came up with this premium Walker’s One Shot; a collection of tantalizing Caesar mixes, made with the best ingredients to produce a Caesar cocktail with the perfect blend of spicing. Use Walker’s One Shot to make your perfect, custom-spiced Caesar, and polish it off with our Rimmer. We have taken the Caesar Cocktail to a whole new level of “awesomeness”. Imagine making the best tasting, and the most flavourful Caesars or Bloody Marys ever, all in a matter of minutes! Impress and wow your friends and family. Now that's possible with WALKER’S ONESHOT.